Many processes in biological and chemical preparation require centrifugation steps. The transfer of samples between the original sample container and tubes required by commercial centrifuges increases the risk of sample contamination, and often leads to the loss of samples. Commercial centrifuges are also not readily available outside laboratory settings. Here we show the design of a simple 3D-printed holder for attaching to the chuck of an electric drill/driver which we use as a centrifuge. 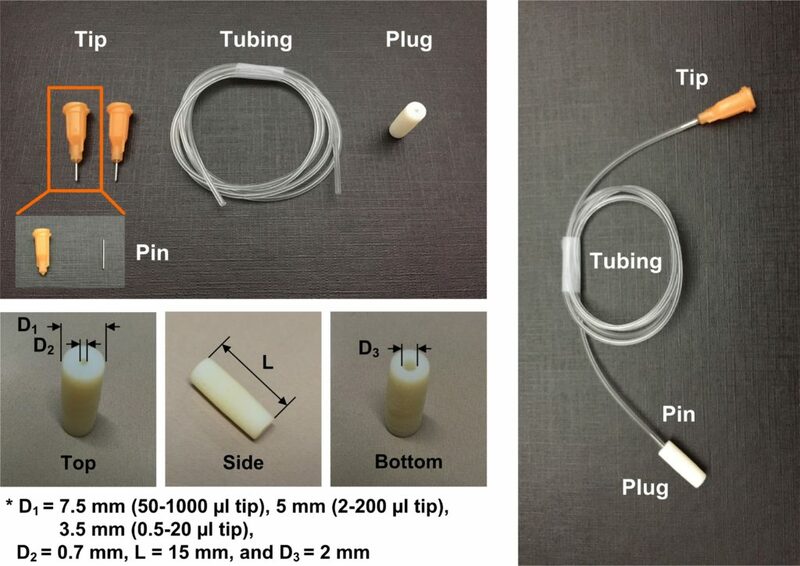 The advantages of this method include: 1) The holder can be designed to hold non-conventional containers (e.g., syringes, glass vials, capillaries). 2) Electric drill/drivers are more widely available than centrifuges. We show that a variety of samples (e.g., water-in-oil emulsions, cell suspensions, food and drinks, wet soil) in various containers can be centrifuged with our method. 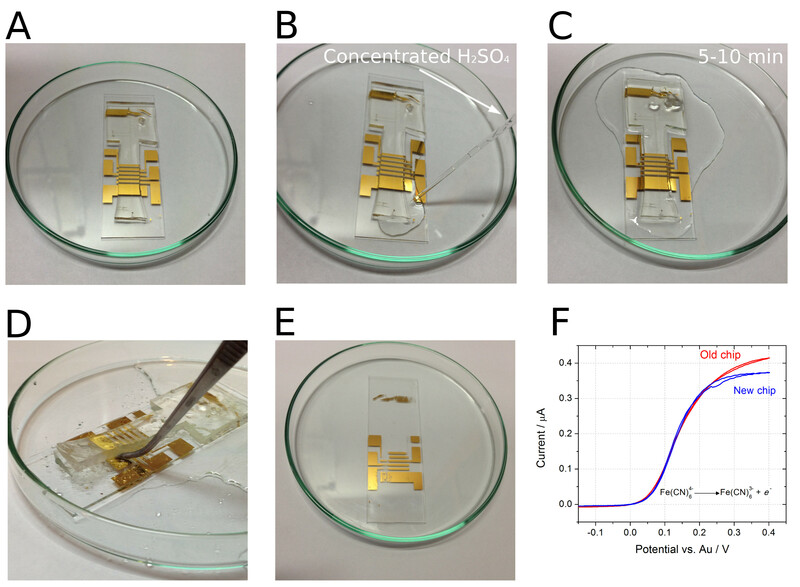 This method should be useful for field work outside of the laboratory, and for the wider DIY community interested in home-based applications that require centrifugation, such as blood separation and related diagnostics, separation of interstitial water from wet soil for pollution detection, extraction and identification of allergens in food samples, and fluid clarification (e.g., olive oil, wine) by accelerating sedimentation. Figure 1. 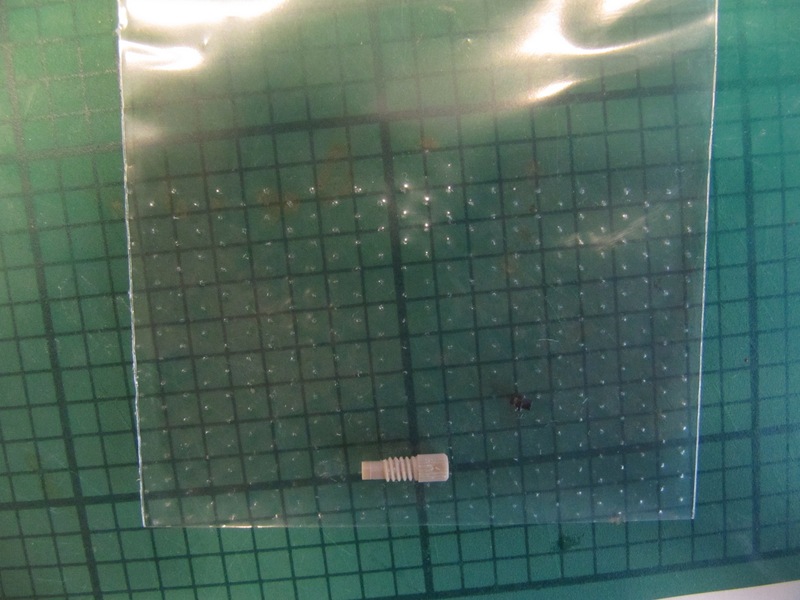 Photo of components needed. Electric drill/driver (DeWalt DC742KA Cordless Compact Drill/Driver Kit ). 3D-printed custom support for the drill/driver. Four 1 mL-syringes (NORM-JECT, Part No. : 4010-200V0) as an example of non-conventional sample containers. One long bolt (Pan Head Machine Screw, Zinc, #8 x 1-1/4”) and one matching nut (Hex Nut, Zinc, #8-32). The dimensions of the bolt should match the chuck of the drill/driver. Four short bolts (Pan Head Machine Screw, Zinc, #6 x 1/2”) to secure the 1 mL-syringes to the 3D-printed custom holder. Design a custom holder using Solidworks or other CAD software. Measure the outer diameter (w1 = 6.5 mm) of the 1 mL-syringe (Fig. 2a). We included a 0.5 mm-tolerance in deciding the width of the slot (w2 = 7 mm) into which the 1 mL-syringe will be secured (Fig. 2b). Decide the angle (q = 60°) at which the 1 mL-syringe will be tilted relative to the plane of rotation. Decide the length (w3 = 80 mm) and the thickness (w4 = 15 mm) of the holder. Measure or identify the outer diameters of the short and long bolts, and use these values for f3 and f5 respectively. Design a custom support for the drill/driver (Fig. 2c). The dimensions of this support are not critical so long as the drill/driver is stable and does not topple during operation. 3D-print the holder and the support. We used a 3D-printer by ROBO 3D . The resolution of the 3D-printer in xyz direction is 100 mm. The material we used was polylactic acid (PLA). Assemble the centrifuge (Fig. 2d). Put one long bolt through the center of the holder and tighten with the nut. Insert the bolt into the chuck of the drill/driver and tighten the bolt by pushing the trigger of the drill/driver a few times. Make sure the bolt is fixed in the chuck and aligned to the drill/driver. Place the drill/driver in the 3D-printed support. Secure four 1 mL-syringes to the holder using the four short bolts. Start the centrifuge by pushing the trigger of the drill/driver for 5-10 minutes. The plane of rotation should be parallel to the floor. Unscrew the short bolts to remove the syringes. If desired, measure the rotational speed of the drill/driver before inserting the real samples. We used the SLO-MO mode in iPhone to calibrate the rotational speed of the drill/driver  (Fig. 2e). Water-in-oil emulsion: Micron-sized uniform water-in-oil droplets were collected in a 1 mL-syringe. 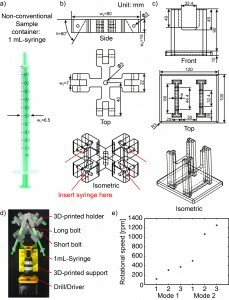 After a needle was connected to the syringe, the syringe was secured to the 3D-printed holder with needle pointing up. The holder was balanced before centrifugation by adding another syringe containing an equal weight of fluids to the opposite side of the holder. We centrifuged the sample at a speed of 374 rpm for 10 minutes. Droplets were then injected into a microchannel to measure the change of volume fraction before and after centrifugation. The volume fraction was defined as the ratio of the total volume of water droplets to the total volume of fluids filling up the channel. After centrifugation, the volume fraction of the emulsion increased from 60% to 86% without a change in the size of the droplets. Neither break-up nor coalescence of the droplets was observed. Stentor coeruleus: To demonstrate the concentration of cell suspensions, we used Stentor coeruleus (www.carolina.com) as a model. We filled a 3 mL-syringe with about 20 Stentor cells suspended in 2 mL of aqueous culture media (concentration ~ 10 cells/mL). 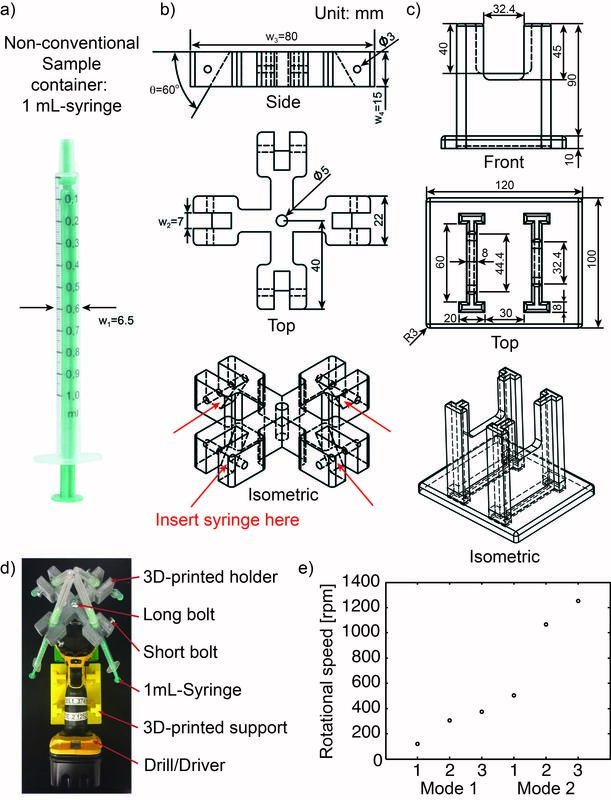 A needle was connected to the syringe which was then secured in the 3D-printed holder with the needle pointing down. The cell suspension was centrifuged at a speed of 374 rpm for 5 min. The cells were concentrated at the bottom, close to the entrance into the needle. 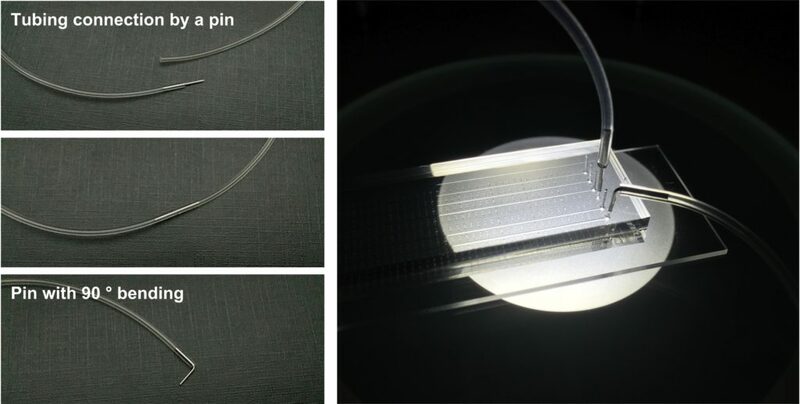 It was then possible to inject this concentrated cell suspension through the needle into a polyethylene tubing. Fig. 2-i) shows the microscopic image of the cells in about 15 mL of aqueous culture media in the tubing (concentration ~ 400 cells/mL). Korean rice wine (Makgeolli): A separate holder was designed to hold a 20 mL-glass vial. The vial was filled with 12 mL of Korean rice wine and centrifuged at a speed of 1252 rpm for 10 minutes. The sediment was clearly observed after centrifugation. On the other hand, the sediment was not observed for more than 20 minutes without centrifugation. Wet soil: 10 mL of wet soil in a 20 mL-glass vial was centrifuged at a speed of 1252 rpm for 10 minutes. Interstitial water was separated from the soil. Figure 2. a) A 1-mL syringe as non-conventional container. b) Drawing of 3D-printed holder generated by SolidWorks. c) Drawing of 3D-printed support generated by SolidWorks. d) Photograph of experimental setup. The 3D-printed holder was connected to the drill/driver placed on the 3D-printed support. Four 1 mL-syringes were then tightened using the short bolts. e) Calibration plot of the rotational speed versus the trigger levels on different modes of the drill/driver. Mode 1 and Mode 2 indicate different gear settings in the transmission of the drill/driver. The numbers 1 to 3 in each mode indicate user-defined trigger levels. The rotational speed ranges from 120 rpm to 1252 rpm. The rotational speeds were measured using SLO-MO function in iPhone 6. 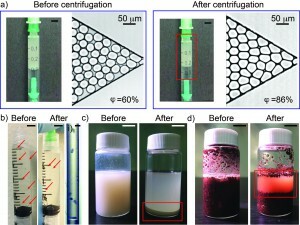 Figure 3. a) Photographs of emulsion in 1 mL-syringe and microscopic images of emulsion injected into a microchannel before and after centrifugation. The scale bar in the photographs is 5 mm. b) Photographs of Stentor cells in 3 mL-syringe before and after centrifugation. The red arrows indicate individual cells. The scale bar is 5 mm. i) Microscopic image of 6 Stentor cells in a polyethylene tubing after centrifugation. The scale bar is 300 mm. c) Photographs of Korean rice wine in 20 mL-glass vial before and after centrifugation. The red box indicates sediments. The scale bar is 10 mm. 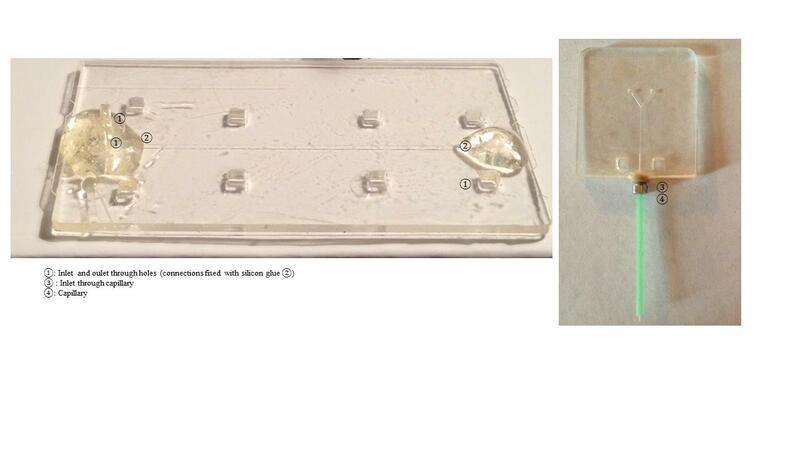 d) Photographs of wet soil in 20 mL-glass vial before and after centrifugation. The red box shows interstitial water separated from wet soil. The scale bar is 10 mm. The centrifugal force can be increased by lengthening the arms (w3) holding the containers. The rotational speed can be measured using a high-speed camera or a smart phone with slow-motion videotaping capability, so long the frame rate is sufficient for the rotational speed used. The load in the centrifuge should be balanced. For safety purposes, safety goggles should be worn. The centrifuge should also be placed inside a safety barrier (e.g., a sturdy laundry basket). The safety instructions for the drill/driver should also be observed. After centrifugation for 10 minutes, we found that the drill/driver started to heat up. If centrifugation time longer than 10 minutes is needed, it should be possible to perform multiple rounds of 10-min centrifugation steps with breaks in between to cool down the drill/driver. In this work, we demonstrated that 3D-printed holders attached to an electric drill/driver can be used for the centrifugation of samples in non-conventional containers. 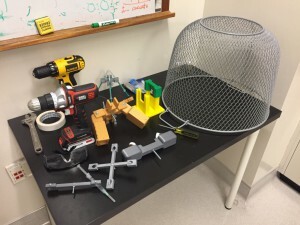 As 3D-printers and hand drills are easily accessible, we expect this tip to find immediate use in settings outside laboratories for field work, and also at home for DIY users. We acknowledge support from the Stanford Woods Institute for the Environment and the National Science Foundation (Award #1454542 and #1517089). 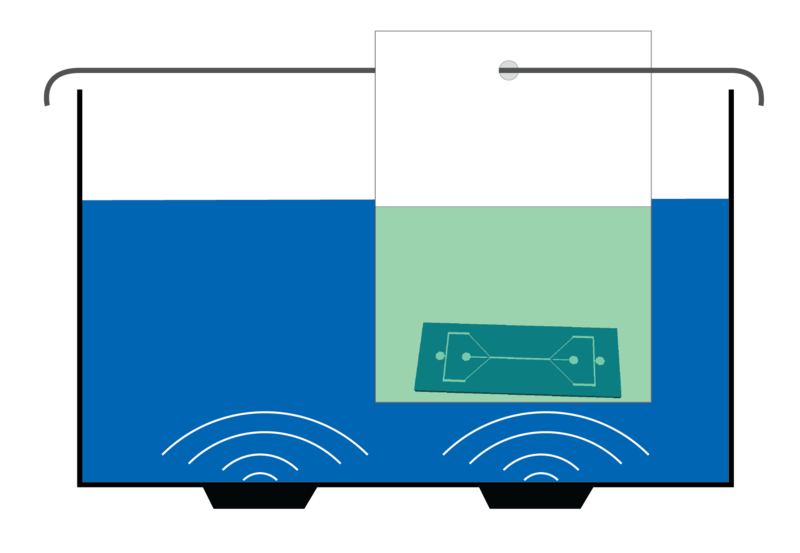 Contact angle measurements are important for characterizing the wettability of a liquid to a solid surface. In microfluidics they are of special interest as they provide insight into the intermolecular interactions between the sample liquid and the microchannel surface. Contact angle measurements are also important when assembling polydimethylsiloxane (PDMS) devices using oxygen plasma bonding. For optimal bond strength the water contact angle of plasma treated PDMS should be minimized as shown by Bhattacharya et al. A current hurdle in measuring contact angles is the requirement of a setup that is expensive and non-portable. 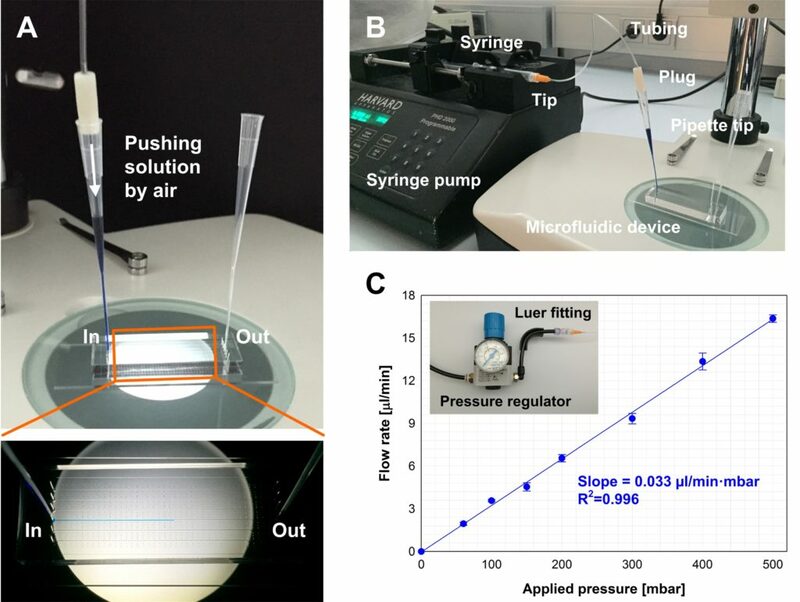 Here we show a method for measuring contact angles using materials and equipment found in a typical microfluidics lab. 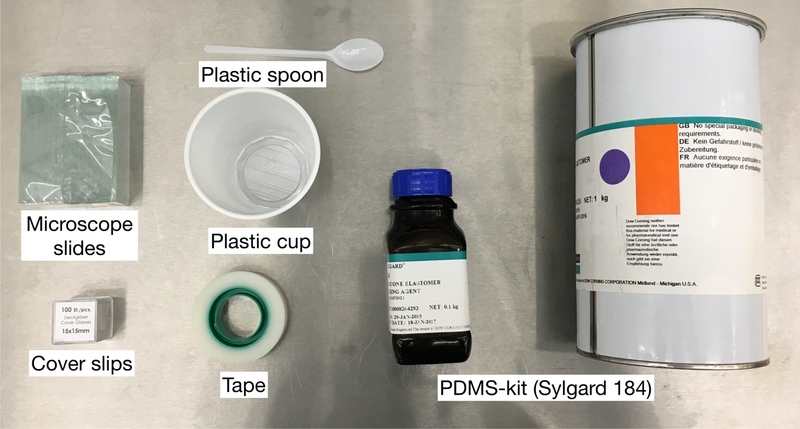 Use the tip of the plastic spoon handle (or a pipette) to place a small droplet of uncured PDMS in the center of a glass cover slip. Repeat with various amounts of PDMS to obtain lenses with varying magnification. Mount the cover slips upside down (e.g. between two glass slides) and cure the PDMS hanging at 70 °C for 15 min. Longer curing times might be necessary, if the drop is relatively large. Center the PDMS-lens over the camera of your smartphone and fixate it using tape. Test the focus of your camera. For our camera setup the best images were captured with lenses that focus around 2 cm. 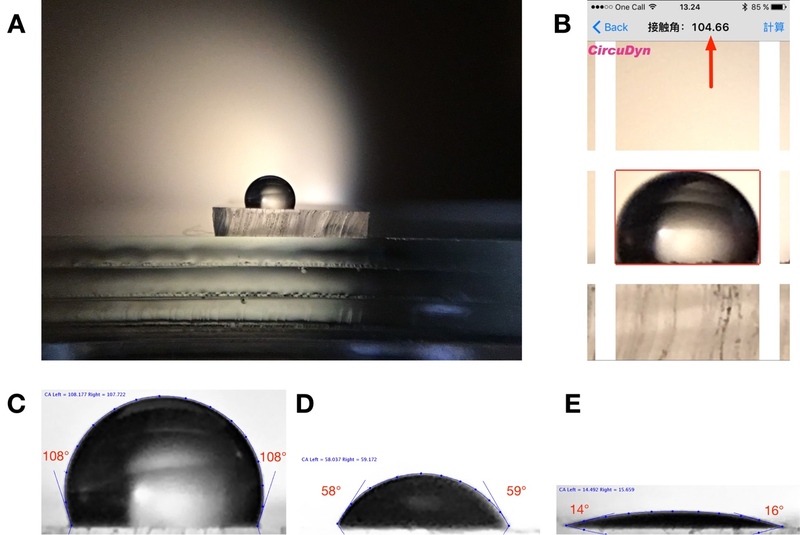 Smartphone contact-angle setup: (A) Focus test of a PDMS lens. (B-C) The smartphone mounted on a syringe pump. The PDMS-lens is mounted on the front facing camera of an iPhone 6S and the sample is centered in front of the lens. The sample is mounted on the pusher block of a syringe pump which can be moved to adjust the focus. Make a sample stage preferably using a syringe pump or some other system that you can move. We mounted the smartphone on the syringe holder block with the camera pointing towards the pusher block. 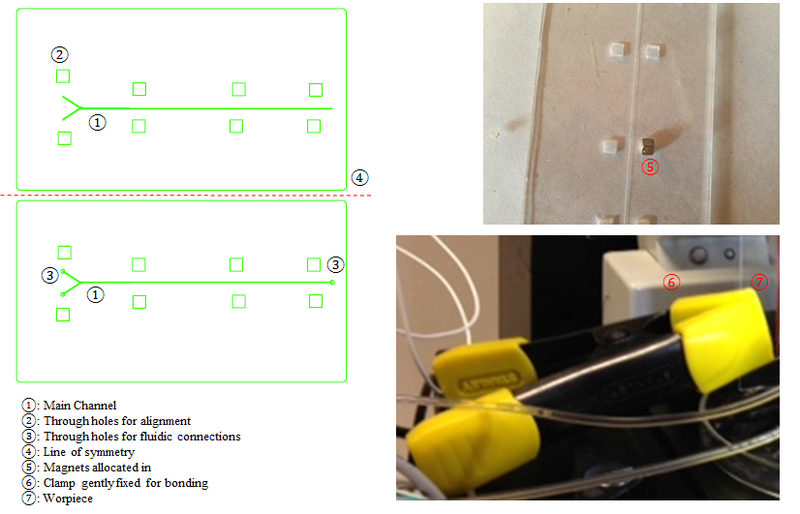 Make a sample holder on the pusher block using glass slides or other consumables found in the lab. Align the center of the stage with the center of the camera. Tip: aligning is easier if done using the sample that you want to measure. Put the sample on the block and move it into focus by releasing the pusher block and sliding it away/towards the camera. Increase the height of the stage until the top of the sample is centered in the camera. Place the light source behind the sample and illuminate the stage evenly. Tip: put the sample stage in front of a white wall and light up the wall for a homogenous background and optimal contrast. Place a small drop (0.5–3 μL) of DI water on top of the sample using a pipette. Place the drop near the sample edge closest to the camera. Move the sample edge into focus. Block out ambient light in the room. Measure the contact angle of the drop in the image e.g. using ImageJ  software with a plugin for contact angle measurements  or get a rough estimate using an app on your smartphone. 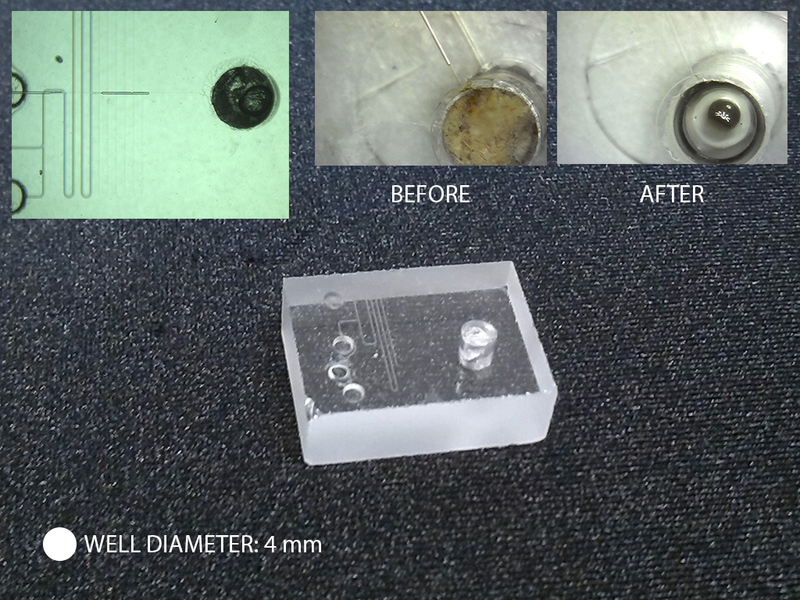 Contact angle measurements of water on PDMS: (A) Raw image from iPhone 6S front-facing camera with PDMS-lens. (B) Direct measurement using app on smartphone (based on θ/2 calculation) (C-E) ImageJ measurements using DropSnake plugin. Unmodified PDMS (C) and PDMS treated with oxygen plasma with increasing intensity (D-E). The focal length of the PDMS-lens is determined by the volume of PDMS used as described by Lee et al. . However, it is difficult to control the volume of PDMS using a pipette due to the high viscosity of PDMS. We recommend making a range of lens sizes and testing them on your smartphone camera to see which gives the right focal length. If your digital scale has milligram precision you can measure the amount of PDMS used for each lens. The mass of each PDMS-lens is typically less than 10 mg. You can decrease the focal length further by adding PDMS to an already cured lens. Modern smartphones have both a rear-facing and a front-facing camera and in our experience the drop focusing was easier when using the front facing camera. The images taken here were captured with an iPhone 6S from Apple using the front-facing camera with a 5MP sensor. The weight of the cured PDMS lens was 7 mg. Tip: you can also remove the PDMS-lens from the cover slip and place it directly on your camera. Although, it might be more difficult to center. Calculating contact angles from images of sessile drops can be done using a range of techniques. If the drop volume is small and the contact angles are not extreme, we can generally neglect droplet distortion due to gravitational effects. Extrand and Moon  calculated that gravitational effects can be neglected for a water droplet sitting on a hydrophilic surface (θ=5°) if its volume is less than 5 μL and less than 2.7 μL on a hydrophobic surface (θ=160°). If we assume the drop to be spherical, the contact angle can be estimated by multiplying the angle between the base and the height of the droplet by 2. This is referred to as the θ/2-method and is implemented by e.g. the Contact Angle Measurement app  for iOS. Sessile drop measurements are generally limited by the experimental setup and operator error, but typically has a precision of ±3°. Image-processing algorithms relying on curve fitting of the droplet outline can enhance reproducibility. ImageJ  with DropSnake-plugin  uses active contours (energy minimization) to track the outline of the drop and calculate contact angles. This increases precision, but is slower and currently requires analysis on a separate computer. The Research Council of Norway is acknowledged for the support to the Norwegian Micro- and Nanofabrication Facility, NorFab (197411/V30). Y. Yuan and T. R. Lee, Surface Science Techniques, Springer, Berlin/Heidelberg, 2013, 51, 3–34. C. W. Extrand and S. I. Moon, Langmuir, 2010, 26, 11815–11822. A.F. Stalder, G. Kulik, D. Sage, L. Barbieri and P. Hoffmann, Colloids and Surfaces A: Physicochem. Eng. Aspects, 2006, 286, 92–103.